Theresa McNeill with her sons on the Catholic side of the peace wall. 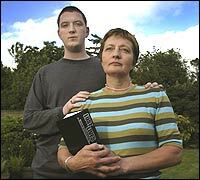 Patrick Finucane's widow Geraldine with her son, John. 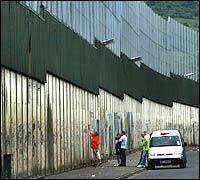 Visitors to the peace wall along Cupar Way in Belfast. The Globe's Charles Sennott sat down with the Sinn Fein president and the Ulster Unionist Party leader. Read excerpts from the interviews. Report on the latest Patrick Finucane investigation, released April 17. Report on the Finucane case from an independent human rights group. Links to reports and news articles on the Finucane case. She remembers only flashes of that moment 14 years ago when her husband, Patrick Finucane, a Catholic civil-rights attorney, was killed by Protestant loyalist paramilitary gunmen in the family's home in an upscale neighborhood of Belfast. She said she has blocked out almost all of what happened. ''I can only hear the bangs. Fourteen shots. Coming and coming, like they would never stop,'' she said. In the history of ''The Troubles,'' as 30 years of political killing are referred to here, the Finucane murder is one of the most troubling. It was Feb. 12, 1989, and the Finucanes were gathered in the kitchen for Sunday dinner with their three children. Two men with black ski masks broke down the front door with a sledgehammer. Patrick rose from the table and made it only to the front-hall doorway. Geraldine rose with him, but then, as the shots began, she fell back into a corner. The children hid under the table. One of the men walked forward firing, blasting Finucane back into the kitchen. Twelve of the 14 bullets struck Finucane's head. The Ulster Freedom Fighters, a loyalist paramilitary group, claimed responsibility. ''That is a road I just don't like to go down,'' says Geraldine, 53, shaking her head at the memory and then glancing protectively at her youngest son, John. He was 8 at the time of the killing; he stared blankly out the window as his mother recounted the ordeal. But down that road to the memory of a 38-year-old husband, father, and crusading attorney sprawled in a pool of blood on his kitchen floor is precisely where Northern Ireland is heading these days as it struggles to reconcile the many injustices of the past. That path has to be traveled to arrive at the darker truths of The Troubles, many here feel, so that Catholics and Protestants can move forward toward a shared future. Slowly and painstakingly, the evidence in the Finucane case has emerged in recent years as the family, Patrick's former law partner, Peter Madden, and the London-based nonprofit group British Irish Rights Watch have connected the dots. The evidence they've gathered reveals a picture of the British Army, the Royal Ulster Constabulary, and agents under their control colluding with Protestant paramilitary groups in the murder of Finucane. In Northern Ireland, the past has always haunted the present. But in the Finucane case and a host of other infamous cases, the past is being exhumed as never before. The British government has at least seven inquiries under consideration or underway. The most ambitious of these is the Bloody Sunday Inquiry, which has cost $150 million, and even after three years of testimony, is not expected to deliver a final report until 2005. In this industry of exploring the past, the Finucane case stands out: The British government itself stands accused of being involved in the killing of a lawyer who was working within the justice system, not a combatant. And the sheer drama of the case makes it more compelling. The story of Patrick Finucane's murder and its aftermath reads like a paperback thriller, with a trail of shadowy leads, dead witnesses, missing or destroyed crucial documents, spy rings, government investigations, and a family that has persevered for 14 years to bring the facts to light. That pressure appears to be delivering results. The alleged trigger man, Ken Barrett, 40, was arrested last month and is awaiting trial in a Belfast court. But this family wants justice to reach beyond Barrett. The Finucanes question why Barrett is being arrested now. They think he is being offered up to block a deeper, and more public, inquiry into what they consider collusion between a British military intelligence unit and a shadowy network of informants under the Royal Ulster Constabulary who were involved in the killings of selected targets by Protestant paramilitary gunmen. The British government has maintained that the clandestine intelligence operations were necesssary to save lives in a war on terrorism and that the use of informants inside the cycle of violence has always opened law enforcement organizations to being tainted by their actions. The British government has repeatedly said that any wrongdoing should be investigated and that those investigations have been carried out. The Finucane family's demand for an independent inquiry received a boost Tuesday when the European Court of Human Rights in Strasbourg, France, ruled in favor of the family, finding that the British government failed to protect Patrick and to mount a ''prompt and effective investigation into the allegations of collusion.'' On the day of the ruling, Prime Minister Bertie Ahearn of Ireland -- joining a growing list of dignitaries, from US congressmen to a UN special rapporteur -- called for a full inquiry into Finucane's death. The Finucane family responds that Stevens is more concerned with delaying justice than finding it. The Finucanes are refusing to cooperate with the probe because they say it is not independent and does not provide for the full disclosure of its findings. Understanding the importance of Finucane's murder begins with understanding his stature on Falls Road, the Catholic stronghold of Belfast. In a painted mural at the gable-end of a block of row houses, Finucane's smiling face looks down on the staunchly republican Falls Road. He was the oldest in a Catholic family of seven boys and one girl and became the first in his family and his neighborhood to go to a university. He graduated in 1973 from Trinity College in Dublin, where he met Geraldine, who was from a middle-class Protestant family on the other side of Belfast. Their love rose above all of the sectarian hatreds that could have divided them, Geraldine says. The five years they both spent away from the Falls in college were when Belfast began to explode with violence. While he was away, Patrick's younger brothers were radicalized in the street, and three of them became volunteers in the Irish Republican Army. Patrick returned to Belfast but believed in working toward change another way -- within the framework of the law, Geraldine says. He became Catholic Belfast's leading civil-rights lawyer, representing Bobby Sands, the hunger striker who died in prison in 1981, and the families of civilians who were killed by British soldiers and officers of the Royal Ulster Constabulary. In November 1988, Finucane represented a particularly controversial client, Patrick McEwan, an IRA volunteer charged in connection with the lynching of two British Army soldiers who stumbled into an IRA funeral cortege. In one of the more brutal episodes of The Troubles, the two soldiers were beaten, stripped naked, bundled into a taxi, and shot at point-blank range. Finucane got the charges against McEwan dropped. Following the McEwan case, Finucane received mounting threats on his life, and soon after was targeted by British security forces, say the Finucane family and human-rights investigators like Jane Winter, director of Rights Watch. The Finucane family and a wide array of rights activists dismiss any suggestion that Finucane was ever part of the IRA. In 1999, Winter, along with Madden and the Finucanes, compiled a secret dossier titled ''Deadly Intelligence -- State involvement in loyalist murder in Northern Ireland.'' The document was handed to the highest levels of the British and Irish governments. The central allegations of collusion -- long scoffed at by the British legal establishment as reckless theories -- have in the last year been recognized as legitimate by Stevens himself, who cited Winter's work in his preliminary findings. Winter said the document, which has never been released in its entirety, finds that the British military established a secret security force innocuously named the ''Force Research Unit.'' But this unit did much more than research; it recruited agents among the Protestant loyalist paramilitary groups, which believe violence is justified to preserve Northern Ireland's union with the British crown. The unit provided its loyalist agents with photographs and intelligence on ''legitimate targets.'' The unit then allegedly sent the agents back to their respective loyalist paramilitary groups, like the Ulster Defense Association, to carry out the killings, or at times, the unit allegedly looked the other way if their agents found that a target was to be killed. One agent from the Ulster Defense Association's most vicious wing, the Ulster Freedom Fighters, is at the center of this web: Brian Nelson, who is referred to in documents and testimony as Agent 6137. Nelson recruited Barrett and also worked with another loyalist fighter, William Stobie, whom Stevens charged with supplying the guns used in the Finucane murder. At trial, Stobie admitted that he was simultaneously an informer for the Special Branch of the Royal Ulster Constabulary and a quartermaster for the Ulster Defense Association/Ulster Freedom Fighters. But the case against him collapsed in November 2001. Barrett was considered a suspect in the Finucane case and confessed in October 1991 to three constabulary officers to whom he was volunteering as an informer. But Special Branch handlers withheld the confession, seeking to retain Barrett as an informant, according to documents and interviews compiled in Winter's report. The documentation from his alleged confession to the crime mysteriously went missing. After putting Barrett under surveillance, Stevens charged him with the Finucane murder on May 29. In January 1990, Stevens's team found Nelson's fingerprints all over classified Force Research Unit intelligence documents and ordered his arrest in connection with a string of murders, including Finucane's. But on the day he was to be arrested, he was tipped off by constabulary officials and fled to England. That same night, a fire ripped through Stevens's office, destroying crucial documents. Nelson's ''handlers' in British intelligence then persuaded him to return. In 1992, Nelson pled guilty to lesser charges. He was released in 1996. On April 11, Nelson died of a brain hemorrhage in Florida at the age of 55, police say. Stobie will not testify either; he was shot to death in front of his Belfast home just two weeks after the case against him collapsed -- and after he had told a Belfast reporter that he supported a public inquiry into the Finucane murder and that he would provide information to such a probe. Hugh Orde, chief constable of the Police Service of Northern Ireland, which replaced the Royal Ulster Constabulary in changes stemming from the Good Friday agreement, served several years as a lead investigator on the most recent Stevens investigation. He said many questions would be answered when Steven finishes his report. But the hallmark of the Finucane case is that so many of the facts dismissed by British police and security forces as conspiracy theories have steadily gained credibility. Last year, in a BBC ''Panorama'' documentary, a hidden camera taped Barrett boasting that he cooperated directly with Stobie, Nelson, and a Royal Ulster Constabulary official in the murder of Finucane. Under the existing terms of the Good Friday agreement, which provides lenient sentencing for convicted combatants in the conflict, Barrett probably would serve no more than two years for the murder. A full inquiry is expected to be recommended in October by retired Canadian Supreme Court judge Peter Cory, who on behalf of the British and Irish governments is looking into allegations of systematic collusion. In an interview in his London office, Cory refused to comment on the specifics of the cases he is investigating. But he did say the Finucane murder has ''a unique set of circumstances'' that has made it the most dramatic of the cases he is reviewing. One of the leading forces in pursuing those questions is Patrick Finucane's oldest son, Michael, who was 17 when his father was slain. Now 31, Michael is also a lawyer, at a firm in Dublin, and helped compile the document handed to the British and Irish governments. He sees signs that Cory will recommend the full inquiry, which will bind the governments to ensure one is carried out. This story ran on page A1 of the Boston Globe on 7/7/2003.